Believe it or not it had been so long since I had read the last volume that I completely forgot it was going to be available for download in September. Good news is I only have to wait until March for volume seven. I wouldn't say this volume is worth waiting a year for (contrary to popular belief I do have a life), but this is a decent read that will take away the blues for a while. This volume centers around the Festival and what the Literature Club plans to do for it. Haruhi, who doesn't even go to North High, wants to form a band, but the Literature Club decides to go the safe route and chooses to make a list of their "100 Favorite Books." However, their plans get somewhat derailed when a childhood friend of Kyon comes into town. Sasaki, that's the friend's name, has a bizarre favor to ask of Kyon, too. If you've read the light novels then you'll be somewhat familiar with her, but this is definitely a different take. This time she isn't Haruhi's rival, but Nagato's. 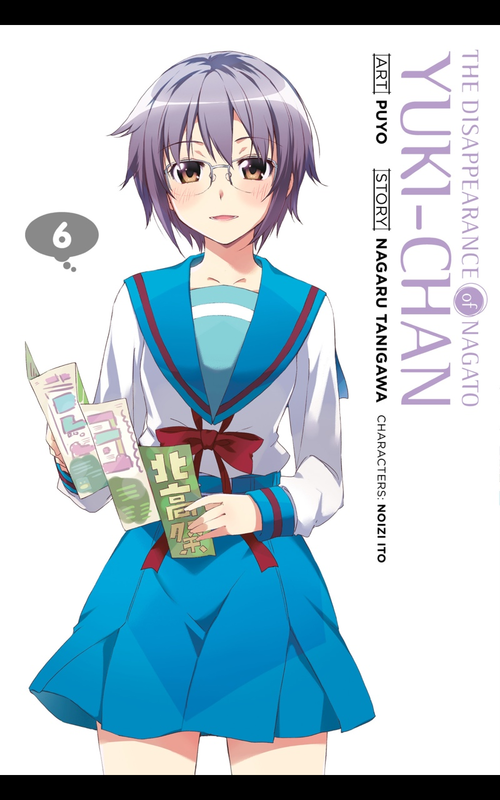 That'd make sense because Nagato is supposed to be the main character and all that, but if you haven't read the light novels than none of what I am saying is probably making much sense. "Why is Sasaki supposed to be Haruhi's rival???" "Who is this Sasaki?" "Why am I reading quotations in italics?" Lucky for you, I've read all of the light novels and you can find my posts about them on this blog. You don't need to be familiar with them to enjoy this series, but you'll definitely get all of the references and in-jokes if you do. I enjoyed this little volume. It definitely didn't seem as long as a regular manga volume, but it was. Time flies, I guess. I just wish this series would creep along a bit faster. Even Attack On Titan has this beat when it comes to the pace of release.